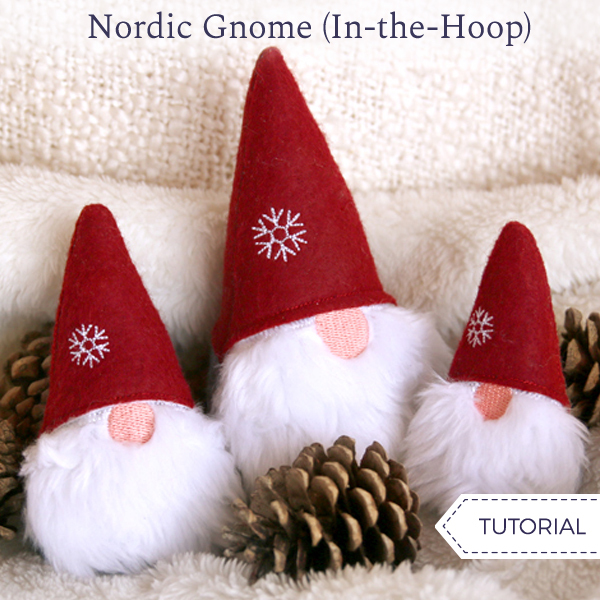 Faux fur brings over-the-top charm to this little gnome! 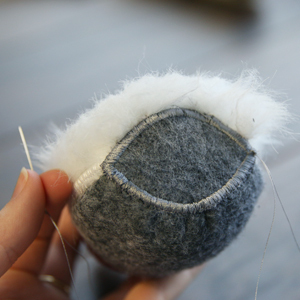 Stitch this design in-the-hoop, complete with fluffy fabric for the beard, then turn, stuff, and stitch closed. We'll show you how! Take the printed dielines for the three files, and cut around the shapes. Lightly spray the back of each paper dieline with temporary adhesive and smooth it onto the right side of the chosen fabrics. Then cut out the shapes. 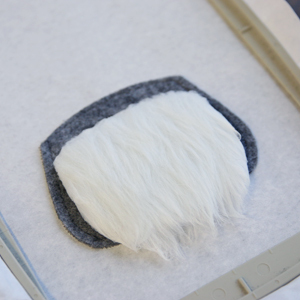 For the beard dieline, spray the paper piece with temporary adhesive, and then smooth it onto backside of the faux fur. 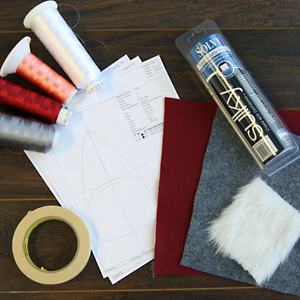 Make sure the direction of the fur is pointing towards the bottom of the piece. Cut out the shape. 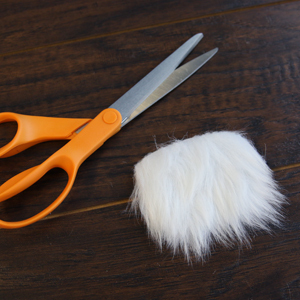 When cutting along the bottom edge, smooth the fur up away from that edge before cutting. This will help to protect the long fur from being cut, and will allow for some to hang over the edge for a fun beard-like effect. Hoop a piece of tearaway stabilizer, and load the back piece file (labeled with an "a") onto the machine. 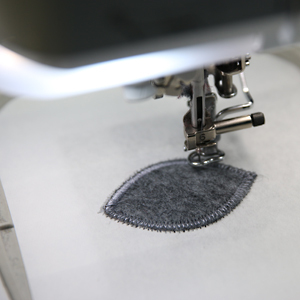 The first thing to embroider is the a dieline which shows where to place the first body fabric piece. 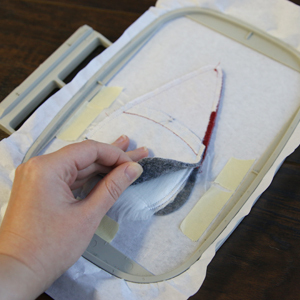 Spray the backside of the body fabric piece with temporary adhesive, and carefully place it within the shape. Then continue to embroider the tackdown, and then repeat to add the hat fabric dieline. Embroider the rest of the file. 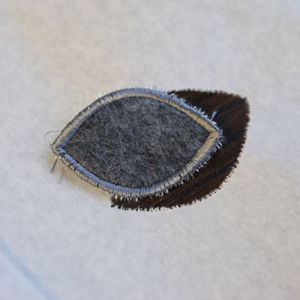 Once the back piece has finished embroidering, tear away the excess stabilizer from around the felt. Make sure to leave the stabilizer on the back of the fabric for now. Next hoop another piece of tearaway stabilizer and load the front embroidery file (labeled with a "b"). The first thing to embroider will be a dieline. Spray and add the body piece onto the hoop. Then embroider the body tackdown and the beard dieline. 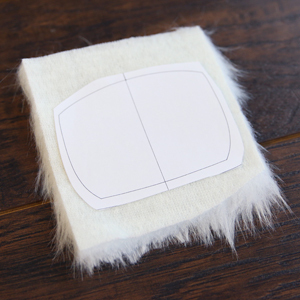 Spray the backside of the fake fur beard with temporary adhesive, and carefully smooth it onto the sewn shape. Once the beard is placed, cut a piece of water soluble stabilizer, and lay it over the beard, making sure to tape it securely in place. 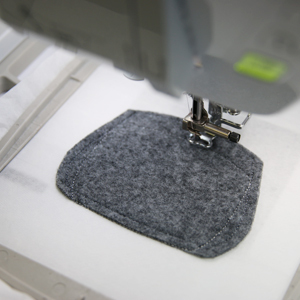 This will prevent the fur from interfering with the embroidery. Then continue to embroider the design. The beard tackdown will sew next followed by the nose of the gnome. 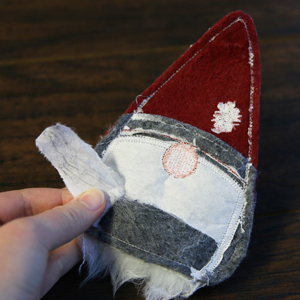 After the hat dieline sews, place the shape and embroider the tackdown and snowflake. Before sewing the "finishing seam" step on the color change sheet, stop the machine, and spray the right side of the back piece (file "a") just around the edges. Place it on top of the front piece, and firmly press it in place. Then finish embroidering the finishing seam of the design to connect the two embroidered pieces. 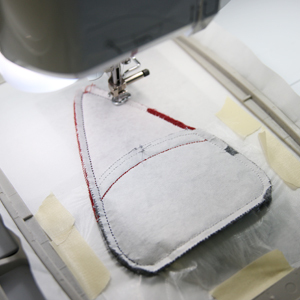 Now that the main piece is finished embroidering, tear away the excess stabilizer from around the design. Then carefully remove the all of the stabilizer that remains on both sides of the gnome. This will make the gnome easier to turn right side out and will allow it to be plumper when stuffed. After the stabilizer is removed, turn the gnome right side out. 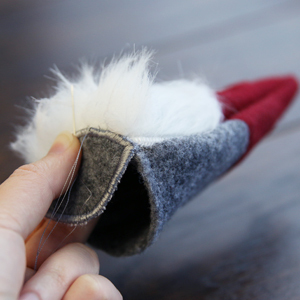 Make sure to completely turn the point of the hat out by pushing it from the inside with the eraser end of a pencil. Then hoop the last piece of tearaway stabilizer, and load the base piece file (labeled with a "c"). 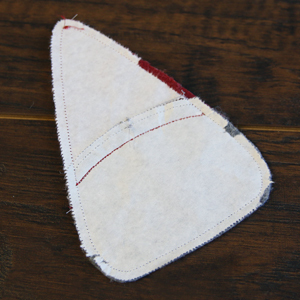 Follow the color change sheet to embroider the piece, and make sure to add the fabric before sewing the tackdown. Once finished embroidering, remove the excess stabilizer, but leave the tear away stabilizer on the back of the fabric. Next, match one corner of the base piece up with the side seam of the gnome. 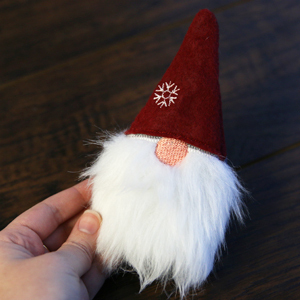 Fold the raw edges in slightly, and use a hand sewing needle and thread to sew the base onto the gnome. 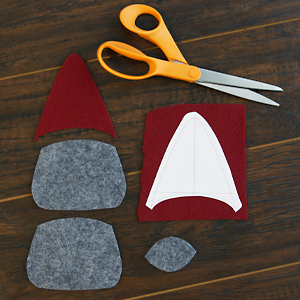 Stop sewing with a 1 1/2" hole remaining, and stuff the gnome with polyester fiberfill. 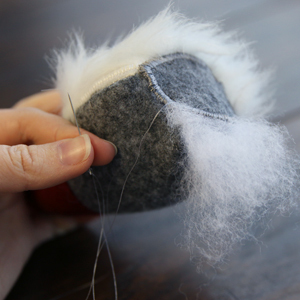 Then finish sew the base onto the gnome, and close the opening. 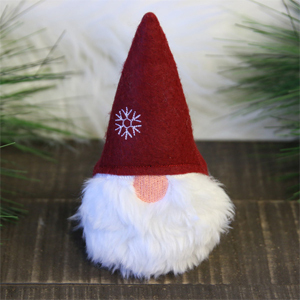 Let your friendly little gnome bring adorable charm to your magical home!